The Christian Association of Nigeria (CAN) has written a letter to Governor Ayodele Fayose of Ekiti State on his 2019 presidential ambition and charged him to remain focused as he is fit with God's grace to solve the nation's problems. 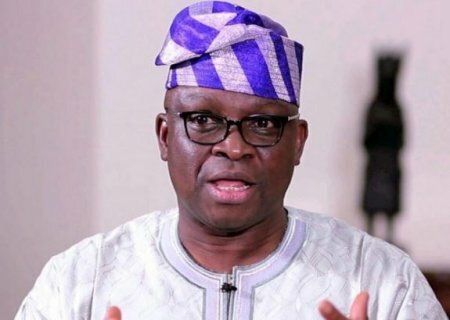 CAN, in the letter, also commended what it said was the courage and the boldness with which Governor Fayose openly declared his intention to contest the 2019 presidential election. In the letter by the national general secretary of CAN, Reverend Dr Musa Asake, CAN also advised Fayose not to be distracted, saying his action could only be done by somebody with uncommon boldness and courage given the harassment and intimidation that would surely follow. The letter stated: “Your Excellency sir, because you are known to doing great in your leadership and that you will move this country forward, the enemies of progress are not happy with your declaration and are not sleeping well. The devil will use many, even those who might be closer to you to try to create lies, false accusation, spread rumours, just to distract people from seeing the good leadership qualities that are in you. CAN noted that the nation’s problems could only be solved by leaders who walk with God and that Fayose had always put his trust in God. It said the assignment of rebuilding the country would not be impossible for Fayose as a leader because God’s grace would be sufficient for him.